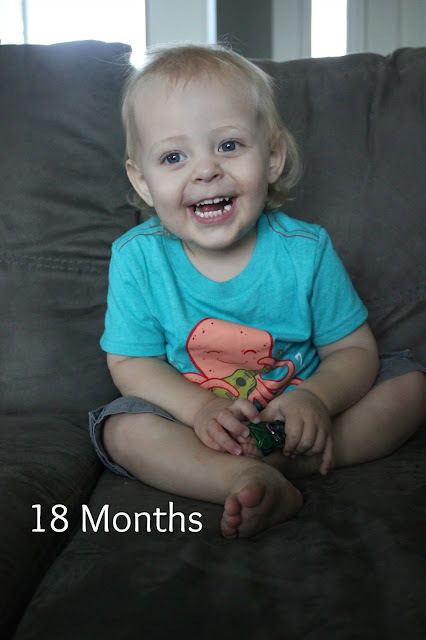 How are you a year and a half?! Time is just flying by with you. It always seems like I turn around and you are talking more or doing more or are just so big! You are doing so much talking now. You may not always be so clear but we can tell what you are saying. You do so much copying and repeating mostly, but you are talking so I don't really care. We can communicate with you and that has been awesome. You definitely understand. We are at the stage where I have to repeat a lot with you, just so you understand that's the way it's going to be or that something isn't okay. But you understand a lot and do a pretty good job of making a good choice when we give you one. Sometimes you get stubborn and dig your heels in but you do a pretty good job overall. It is a bit frustrating when we know that you understand but you chose to ignore. You are only one so that's just the way it is! You are constantly on the move now. You are big into dancing these days and are always willing to bust a move. I miss when you used to sit in the cart without fight but now all you want to do is walk around the store. It definitely makes shopping a lot more difficult, but I love how you love to explore and check out the world. We have had some issues with eating these days. You love breakfast and lunch without issue, But we get to dinner and you refuse to eat. You just don't want to even try it. Then you get cranky and start screaming. We won't give you anything else and eventually you will come around to eating a little bit of your dinner but it's a bit exhausting to do this everyday. However in the last week or so you have gotten a little better about eating and have been more willing to eat what I come up with for dinner. That has definitely been nice. You are big into building. You love to get the mega blocks out and just start building. You also do some building with train tracks or at least try then have me build you a track. Mostly all you ever play with is building blocks and trains and cars. You are also a big fan of Mickey. You get so excited whenever I turn on Mickey. Heck you get excited when you wear a Mickey shirt. But your favorite movie right now is Moana. You are always dancing to the music and just can't seem to get enough of the movie. You have definitely been testing me lately but overall you are a pretty easy-going kid. You go with the flow. You nap well. You sleep through the night without issue. You wave at everyone you see. You are just happy. I hope you always stay that way. You just continue doing you and being my happy boy. I love you so much, goon.